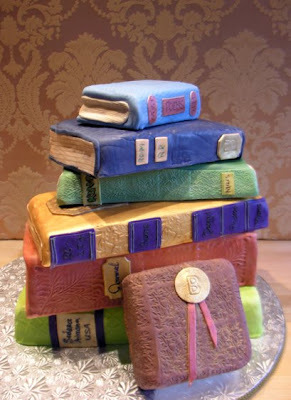 A stack of books ....or is it a cake! Completely edible down to the embossed white chocolate "covers" , these books were devoured at the annual Sedona Festival of Wreaths held at the Sedona Public Library. Thanks go to my friend and fellow cake competitor on Food Network Challenge - Michelle Bommarito - michellebommarito.com for her help and advice with this cake! oh my goodness! how cute is this cake! love it!